Pall Corp., of East Hills, N.Y., introduces its Magnum Series High Capacity filter cartridges. 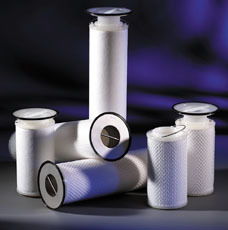 These large, six-inch diameter absolute-rated filter cartridges are designed to deliver high efficiency cartridge filter performance coupled with the ease of use of bag filter systems. Magnum filters allow current bag filter users to upgrade to cartridge level performance with no change in hardware since they readily retrofit most existing size 1 and size 2 bag housings and baskets.